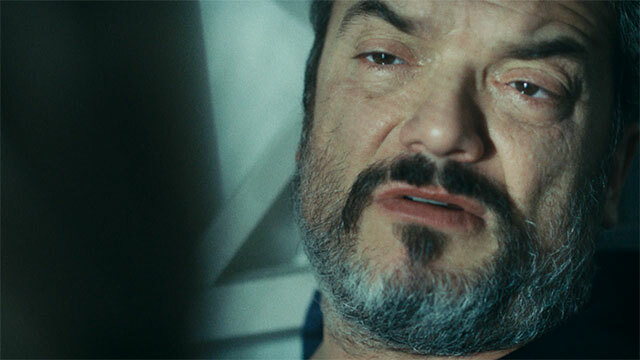 Alex (Dragomir Mrsic) is a crooked cop Swedish cop who – in collusion with his partner, Martin (Eric Ericson) – is heavily into drugs and the corrupted world of Gothenburg’s underbelly. If you want to avoid all spoilers, we suggest you stop reading this article now. The action starts one evening whilst Martin, Alex and their wives are celebrating the news that Martin and his wife, Sheila (played by Malin Arvidsson, who is well-known to Swedish drama fans from the Arne Dahl series where she plays Kerstin Holm), are soon to become parents. One basic rule of crime drama is that if a character is celebrating something like impending parenthood, just around the corner lurks impending tragedy; and that’s what happens here. Martin gets called away when an underground contact summons him to a remote industrial area. “Don’t go, Martin!” we implore – but of course he goes. Alex follows him in his car, concerned for his friend’s well-being, and arrives just as bullets start to fly. Alex returns fire – but it’s dark and the abandoned, industrial surroundings make it hard to tell who is firing at whom. When he finds Martin’s body, slumped on the floor with a fatal gunshot in his neck, he realises that it was his bullet that did the damage. Burdened with guilt, Alex decides to go straight and leave behind his shady (but lucrative) lifestyle. This is easier said than done; and when the crime boss – the hilariously named BG – gets wind of Alex’s intention, he sends a message to Alex and his wife – in the shape of three burly thugs who break into their home at night – to encourage him to re-think his decision. At the same time, Alex has been assigned a new partner – Frida (Rakel Wärmländer), a young female cop with high morals and little experience. She’s been asked to keep an eye on her new partner, as the top brass are starting to have suspicions about Martin’s death and Alex’s involvement with the criminal classes. Frida lives with her girlfriend, Åse, a psychologist who – coincidentally – has been asked to treat Alex following his partner’s death. Whilst counselling him, Åse learns that her girlfriend and Alex have a history that she’d failed to mention. Dragomir Mrsic co-created the show and sounds like a fascinating – if slightly scary – individual! Born in Bosnia and Herzegovina, he was involved in Sweden’s biggest bank heist in 1990 and served a three-year prison sentence for his trouble. He’s also a Taekwondo champion, a coach for the Swedish Olympic Committee, has trained the likes of Martina Navratilova in extreme fitness, and has a video game – Payday 2 – based on his likeness. In addition, he’s starred alongside the likes of Tom Cruise (Edge Of Tomorrow – 2014) and Sofia Helin (Man Divided – 2017), as well as in episodes of Wallander and Crossing Lines. There are a lot of interesting threads to this story. On the face of it, it’s a straight-forward tale of bad cop trying to turn the corner. But there’s more to it than that – it involves family relationships, as well as issues of morality and trust. It’s well acted, and the eerie, industrial soundtrack adds to the stark, unnerving ambience. Alex – a six-part series – looks well worth sticking with. Alex will air on Channel 4 at 11pm launching on Wednesday 26th September 2018. The full series will also launch simultaneously on All 4.